The Swordmaster's Grimoire: Dr. Frankenstein, I Presume? Suppose you wanted a new Cadillac. You find out that you could save a lot of money by purchasing the individual parts off the assembly line, rather than buying a whole car completely assembled. So you rent a dumptruck, back it up to the Cadillac plant and they load all the parts of your new DTS into the dumpbox for you. You drive home and dump all the parts out in your driveway. Now you sort through the debris until you find the ignition. You stick the key in and turn it over. Can you drive away in your new Caddy? You HAVE all the pieces, don’t you? It’s not just having all the pieces that matters; it’s how they’re put together that counts. This is very much like studying a martial art, including fencing. It isn’t enough to learn a bunch of different techniques. You have to understand how each piece is connected to all the other pieces to form a coherent whole. Each technique has to make sense, not just in and of itself, but also in relation to everything else, technically, tactically and strategically. Instead of a getting a new Cadillac, let’s suppose you’ve really done your research, and you’ve determined what the “best” parts are of various cars, which is to say the things you “like” about each one. You’re no fool. So you go get the chassis from a Lincoln, doors from a Cadillac, the engine from a Ferrari, wheels from a Volvo, drive train from a Buick, and so on. Now you try to cob your car together. These are all great pieces individually, made of superb materials, well-crafted. But they weren’t designed to work together. I’ve actually had a beginning student who wanted to study different weapons with different teachers all at the same time in order to select out what he liked for his “personal style.” And this was not a child; this was a “mature” adult. Now, understand, it’s certainly true that each person is a unique individual and expresses things uniquely. You WILL eventually have a “personal style.” Can’t help it. You can only fight like the person you really are. “Personal style” isn’t something you have to work to create. I suggested that maybe before he worry about creating his own unique personal style, he might want to learn how to fence first. Otherwise your “personal style” will just be a collection of limitations -- habits, faults, errors and weaknesses – that any opponent with a brain bigger than a fruit fly’s will exploit. Hello, Mr. Concrete Wall, how are you today? 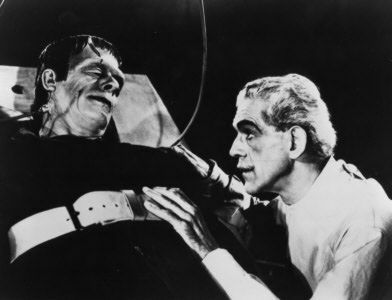 It’s tough trying to explain to someone who has utterly no comprehension of combat or training for combat, why the Frankenstein approach isn’t a very good one, at least not if you want to achieve an appreciable level of skill in any of those weapons. Now, there ARE some things that you CAN transplant from one place to another. Foundational principles apply across the board. The fighters’ mindset is the same, no matter what weapon you’re using. And some individual pieces may even be switchable. Lots of cars have the same size tires, for example. That tire iron might fit the lug nuts on a variety of vehicles. And the lucky dice you’ve got hanging from the rearview mirror, right above your glow-in-the-dark plastic Jesus? Sure. That’ll work. But to know what you CAN transfer and what you CAN’T, you have to know how everything in the first car is connected AND how everything in the second car is connected, too. Only then can you determine if you can take a carburator, or distributor or engine from one and swap it into the other. You have to know BOTH cars very well. What I’m suggesting is, pick something and learn it. Then pick something else and learn it well. In the long run, over time, the things they have in common will, indeed, integrate into a coherent meta-whole. Could you perhaps provide some specific examples in fencing? That is, would the lucky fuzzy dice be like a particular way of putting on your mask, or the glow-in-the-dark plastic Jesus would equate to your method of saluting? What components are nearly always interchangeable, and which are unique? First of all, I’m glad you’re enjoying the blog! I’d be able to give you better, more specific answers if I knew something about you, your experience, etc. I’d rather give you answers that are really specific to your situation and needs, rather than just generalities. But that’s up to you. One caution: don’t take analogies too literally. Look where I’m pointing, not at my finger. What is common to all combat (and a lot of other things) are the foundational principles. Those are the components common to all forms of fighting. It isn’t about “techniques.” It’s certainly true that there are only a finite number of ways to move the human body, so it’s not surprising for there to be similarities in technique among a wide variety of fighting methods and weapons. But that’s not really the important stuff. Technique is only your ante to get in the game. Without it, you’re very likely to be Le Toast. Everyone worth their salt has technique – and real good technique, too. Seldom is the fight won on who knows what technique. The botta secreta is a myth. Any “secret technique” you discover or invent has been practiced, taught, written about before. Rather, the fight is about the flawless execution of fundamentals: the right thing, at the right time, against the right opponent. It’s not that someone knows a superior technique, but rather that someone applies his technique in a superior manner. That’s why sometimes the developed example of an inferior principle can defeat an undeveloped example of a superior principle. That's also why I'll decline to give fencing-specific examples, for now. If you understand what I'm saying, you'll be able to see a hundred examples on your own. If you don't, my citing a couple won't help -- I'll just be further fixating you on technique. And that's not my point at all. The main point I was trying to make here is that a fighting “method” is more than just the sum of its parts. The way they are assembled creates a powerful synergy because they support, compliment, facilitate and reinforce each other. This is definitely a post I can relate to. I took Tae Kwon Do for several years, took a break, and then started the beginning fencing class. If I tried to combine the two(being as inexperienced as I am in both), all I'd end up with would be a really, really bad guard stance. Very glad it struck a chord with you.